CALOCERUS and PARTHENIUS, two brothers, possibly eunuchs, in the palace of Tryphonia, wife of the Emperor Decius. During the Decian persecution, the daughter of Roman consul was placed in their charge. In 250, SS. Calocerus and Parthenius were charged by Decius with embezzlement of their ward’s funds, as well as the crime of being Christians. When brought before the court, SS. Calocerus and Parthenius disregarded the accusation of financial impropriety but did offer a defence of Christianity. The court ruled their apology was equivalent to an admission of being Christians, and they were sentenced to death. SS. Calocerus and Parthenius were tortured and then beheaded. CYRIL, the fifteenth Bishop of Trier, from circa 455 until his repose circa 457. The relics of St. Cyril were interred in the Church of St. Matthias in Trier. DUNSTAN, our father among the saints Dunstan of Canterbury was born to a wealthy and noble family in Wessex and educated at Glastonbury. When he was about twenty-five years old, he received monastic tonsure, and was ordained to the priesthood by his uncle, St. Alphege the Elder (12th March), Bishop of Winchester. He lived for a while as a hermit at Glastonbury, but in 943 was made Abbot of Glastonbury by King Edmund. As Abbot, St. Dunstan renewed monastic discipline and under his leadership the abbey was rebuilt and prospered. Glastonbury became a centre of learning, while at the same time St. Dunstan helped revitalise several other nearby monasteries. In addition, St. Dunstan was a proficient goldsmith and metal-worker. Following the murder of King Edmund, St. Dunstan was appointed advisor to the new King Eadred, and St. Dunstan undertook a reformation of all the monasteries in the kingdom. Forced into exile by King Eadred’s successor, King Eadwig, for chastising his scandalous lifestyle, St. Dunstan spent time at the monastery of Mont Blandin near Ghent in Flanders. King Eadwig’s rule was short-lived, and St. Dunstan was soon recalled by his successor King Edgar. 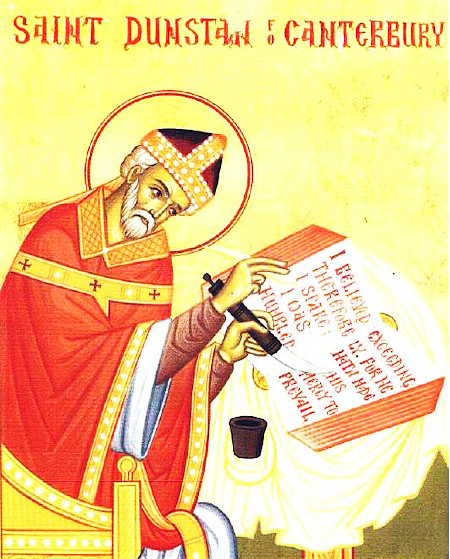 Upon his return St. Oda the Good (2nd June), who was Archbishop of Canterbury at the time, consecrated St. Dunstan a bishop and appointed him to the See of Worcester. About a year later, when the See of London became vacant, this too was conferred on him. Then, in 960, King Edgar named St. Dunstan Archbishop to the vacant See of Canterbury. As Archbishop of Canterbury, St. Dunstan became a close advisor of King Edgar and gained such influence that he became virtual ruler of the kingdom. He introduced reforms in the life of the realm, both within the Church and in the State. The high point of St. Dunstan’s work and statesmanship was the coronation in Bath of King Edgar in 973 by the himself and the Archbishop of York. The coronation service created by St. Dunstan became the basis for British coronation service in use to this day. and to provide them with strict rules of pious order wherewith to govern their lives. Wherefore, the Church of Christ doth ever praise thine all-honourable name, O holy bishop. Two years later King Edgar reposed and was succeeded by his son King St. Edward the Martyr (18th March), whom St. Dunstan crowned in Winchester. Following St. Edward’s martyrdom, St. Dunstan performed his last act of state, crowning King Ethelred, whom he rebuked for his involvement in St. Edward’s martyrdom. St. Dunstan foretold the coming misfortunes that were to befall the kingdom. St. Dunstan retired to Canterbury, where he spent the remainder of his life active with his Archiepiscopal duties. He reposed in Canterbury in 988 and was buried in his cathedral there. His relics were translated to a tomb near the high altar of the new cathedral after the fire in 1074. HADULF, simultaneously an Abbot of the Abbey of St. Vaast in Arras, Pas-de-Calais, and Bishop of Arras-Cambrai. St. Hadulf reposed circa 728. PUDENS, (First Century), a Roman senator baptised by the Apostles, whose home was initially a refuge for the Apostles, and then one of the first churches in Rome. The father of St. Pudentiana (vide infra), he may very well be the Pudens mentioned by the Apostle Paul (29th June) in II Tim. 4:21. PUDENTIANA (POTENTIANA), (Second Century), daughter of St. Pudens (vide supra), and sister of St. Praxedes (21st July). She and her sister devoted their lives and wealth to providing proper burial for martyrs, and care of the poor. 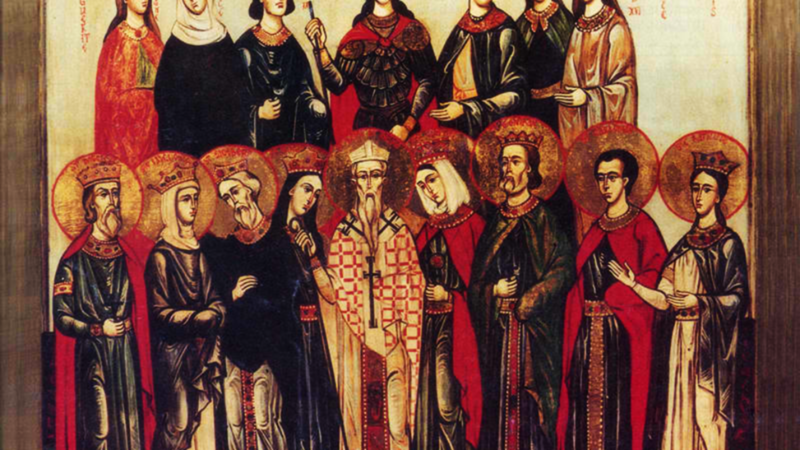 While there is a popular tradition that St. Pudentiana was martyred at the age of sixteen, there is no information extant that confirms this.